StudioJRU is hosting a special Christmas giveaway on the blog today! I don’t have that much wall space. I have to be picky. Art decor for our home. My husband often laughs at me when I say I like to go for the “minimalist look”. Because seriously, I have a weak spot for anything inspirational, especially when it comes to integrating art with God’s word. That is what Jennifer of StudioJRU is gifted to do: inspired art. We each have a unique way of expressing God through us. Jennifer does it through her fingers, hands, eyes — and most importantly — her soul. When I was first drawn to Jennifer’s artwork, I had just begun writing for (in)courage. I wanted to get a piece of art that would mark this special milestone — joining a sisterhood of writers, while earlier I had written solo. I wanted to remember the moment with something visual. As I browsed Jennifer’s art pieces, I immediately fell into a dilemma. It felt like I was at the candy store again as a little girl, not knowing what to chose. They just all looked so good. But, you know what? God speaks through art. As I clicked and considered which piece to get, I saw it. I liked Jennifer’s layering technique. It reminded me that serving my family is a mosaic of different pieces. Writing — finding my voice — is one of the ways God fills my soul, so that I can give out to serve my family. Everyone has a unique way of serving their family. But at the time, I was struggling with how I wasn’t like some moms. I wasn’t crafty enough or organized like others (weekly meal plans, oh my!). Until I realized I’m creative in other ways. I love reading to my boys, unwrapping Jesus with them while out on adventures and meeting new people. And you know what, I love opening the fridge and spontaneously cooking what’s available (I grew up stir-frying Chinese!). What truly matters is where my heart is. If my heart is focused on pleasing the Lord, then it won’t matter what it serving looks like — whether writing or being a mom. That’s what I love about art. 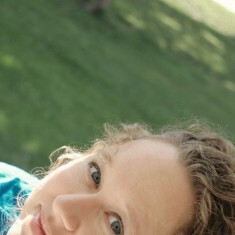 Back in October, I introduced you to artist Jennifer and Studio JRU as Faith Barista’s 2011 Relevant Conference Sponsor. Today, Studio JRU is back with a double treat. One winner will be randomly selected and receive her pick of a print (value up to $30). Click here to see the 18 pieces to select from! Click here to browse the 18 piece collection. Which print would you pick? Pull up a chair and share. Click to tell us which piece — you’re automatically entered to win your pick. Do you enjoy inspired art decor? StudioJRU sponsorship enabled me to join the community of Christian women bloggers at Relevant 2011, so if you’re looking for something special to mark a personal milestone or a faith-inspired gift, please stop by Studio JRU and shop. You can connect with Jennifer on the web, Facebook, blog and store. 1. Share a comment or blog post by Midnight Monday 12/19/11. 3. Share this post on Facebook or Twitter (Click the “Share/Save” button below) and leave extra comments letting me know. Today’s brew is a sponsored post. I caught my breath when I read this. Because I have just written, at the end of my annual Christmas letter, “As for me and my house, we will serve the Lord”. Words which came to me this morning when I was praying how to end the letter – which goes to many non-Christian friends – to somehow explain how and why we live as we do. (Nothing extraordinary, just trying to follow Jesus.) Wow, how appropriate, I thought. But then I scrolled down, to find the words of blessing from Philippians ‘I thank my God every time I remember you,…’ Words I have used to friends and family since I first became a Christian. So that is the one I would love to win: it will go to my son, Jonny. I love to say those words to him over and over again. If my name were selected, I would choose the “I thank God” print. Our pastor once spoke eloquently about the value of naming things, of the gift that doing so is in this life. There are people, too, that I literally do thank God for each time they come to mind. This would be an awesome gift for them! I would pick As for Me and My House! I love the Thank God for You print. i would choose the this family believes piece. beautiful, simple, bold. i love it! 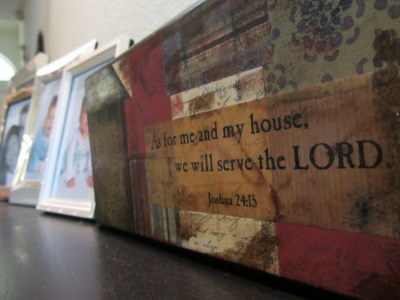 Woukd love to get the For My House print that is just beautifully done! Oh my! I am in love with two pieces: the giraffe one for a baby’s room is adorable. We just had our third baby in October and with a 2 and 4 year old, I haven’t done much in the way of decorating it. But I also LOVE the “Me and My House” one with the rich, earthy tones. So hard to choose….. Thank God for You I guess is my #1 favorite. They are all beautifully done. It’s hard to choose, but “Me and My House” or “apple of His eye” saying are my top choices. Thanks for a chance to win one! Your posts are always encouraging or thought provoking. I’m subscribed to Faith Barista. Definitely ME AND MY HOUSE, love love love it!! I’m subscribed to Faith !! Wow. I love the tree with Believe. Simple reminder that Jesus speaks to me. I also felt like a kid in a candy store…I loved so many! What a gifted artist. I love the mixing of God’s word with the different mediums of photos, paints etc.- it brings it to full light! What a wonderful giveaway! I absolutely love the “Picked” print with the adorable giraffe – it would be perfect in our 5 week old daughter’s nursery! It would look great in my livingroom next to my red wall. I absolutely love, love, love Jennifer’s artwork and anyone can see her God given gift and talent. Thank you for sharing and would so love to have one of her pieces in my house. Celebrate Jesus Everyday! “Me and My House” without doubt or question — this has been a key verse in our married life and I love the layering, shading… lovely! These are all beautiful, I would pick the Philipians 4:13 picture because I can do anything with Christ by my side!! So hard to choose! I fell in love with her artwork at Relevant. It’s a toss-up between Believe and Noel, my heart being full with Christmas at the moment. I think if I had to choose, I’d go with Believe, though. I would chose “This Family Believes” because in the world today people hide their faith and the Father is not #1 anymore. He needs to be made public again and be the center of our lives. We all have special gifts. Not all of us can quilt or sew or do what’s expected, but our gifts are perfect for our situation. And . . . I tweeted the giveaway! My first choice would be “Let your light shine.” If we all did what God created us to do and loved like He created us to love then we would shine. All of us !!!!!!!! Thank Jennifer for Letting her light shine !!!!!!!!!!! I loved the Believe hanging so much I couldn’t wait to see if I had won, so I purchased it for my sister. She has “Believe” everywhere in her house and I know she will love this wall hanging. If I am fortunate enough to win, I would love to have the Me and My House hanging. I’m with you Bonnie – I really love the look and feel of that piece. I would choose the As For Me and My House Print. I have raised 6 kids and it has always been my hearts cry that each of my children find their own personal relationship with the Lord. My husband and I have dedicated our lives to pouring as much of Him into them as we could so that when they left the nest, they had confidence and strength in their faith! I just posted on fb and tweeted the giveaway! We have moved around a lot. After setting up house, I always look around as someone arriving to my home. Do they know this is a Jesus serving home? These works of art show others and remind you and yours that this is so! Blessings to you all! I love Jennifer’s work! It is beautiful and inspiring! 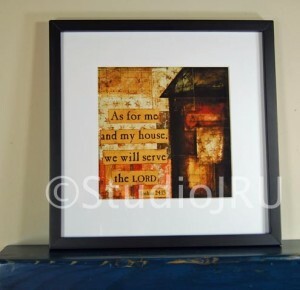 I would select “As for me and my house, we will serve the Lord.” This print is special to me because the Lord has kept me and my family safe during a very challenging past 18 months as our lives have turned upside down due to circumstances outside of our control. Looking at her print reminds me of just how much God loves me and my children. I like the “Among Us” piece. I love Jennifer’s stuff and would be thrilled to win! It definitely would be “THIS CHILD”… I wept as I read it… my daughter is going through a painful divorce from a 17 yr..( since she was 17).. horridly & constantly abusive marriage. Her children are now showing the repercussions of it. We are so on our knees daily for these precious children, and all they should never have seen or heard or felt. She loves the Lord and I know this would bless her. I also have a special request. If its not alright to put it here I understand that you may have to remove it. I am battling for my life with inoperable spinal tumors and a constantly breaking foot and ankle. I have no one to help me make this a Christmas to remember for my daughter and her 4 children who will visit for a few days at Christmas. Her children are 5 to 15. I know it’s late, but we are believers… so if there is any chance there are still some people out there that may want to become Christmas Angels ( or secret santas…) can you please share this message and let me know? Its only 9 days away… but I am believing Him to help us celebrate His birthday with this precious family. Thank you ahead of time! As of right now, I have nothing for them for gifts, or for my daughter.. thanks so much! am a long time subscriber! I scrolled through the pieces and then I saw IT! 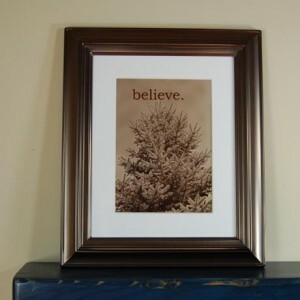 The photo of the tree and the word “believe”. That is my ‘word’ for life… I would pick this piece! I have this word on plaques, jewelry etc. all over my house, and it would be a lovely piece to add to my collection. If I don’t win, I may just go and buy it. 😉 It’s beautiful! Thanks for the opportunity to win a piece from Jennifer. Hands down, As For Me And My House! I love the warm, around-the-hearth feel and the beautifully collaged design. Love it. I remember finding this beautiful artwork before (probably following a link from your site) and I couldn’t make up my mind at the time which one I would pick. I make collage journals that will someday be passed along to family and friends when I pass along. This artwork reminded me of my own. And I love words so I thought it really cool. If I were to win, my favorite is “I thank God for you” and I would personalize it for my best friend who is not a believer but I think she would really like the sentiment anyway. Thanks for sharing this wonderful talent with us. I would pick Such Things. I struggle with my thoughts more than anything and this would go in my family room/ kitchen area where I spend most my time. Every time I start to think thoughts unworthy of God, this would draw my attention back to what God expects of me. I love Jennifer! I’d pick “Picked” – perfect for our soon-to-arrive little baby’s room! Philippians 4:8 would be my pick. A reminder to think on those things above and eternal! The Always With Us print says so much. Thanks for sharing, Bonnie! I’m going to have to check out the rest of her shop! I’m having a hard time choosing because I like several of these. I think I would have to pick either “Me and My House” or “Such Things”. Too many wonderful choices! I think, though, that I would have to choose “Me and My House”. 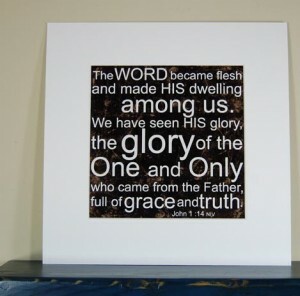 When my youngest daughter was in middle school, she did a small cross stitch of that verse for us as part of a collage for the bathroom–a bit strange, but the perfect place for a bunch of girls to see it daily! At that point, it meant “as for me and my family… we WILL serve the Lord!” and two of my girls went to Africa as missionaries. Now that they’re gone, the meaning has changed. God has challenged me to continue to use my home (my physical house!) to serve Him. The meaning has changed, but my faithful God hasn’t! He still expects us to serve Him and He continues to strengthen and provide… What an awesome God we serve! I really like the Scripture verses that are personalized with an individual’s name! I like all three of them, but I think my favorite is the first one called “Strength”. Wow! So powerful and so beautifully done! Ahhhhh—the Proverbs 31:25 piece . . . I need the reminder. I am a subscriber, and I really like the Believe! Its just a beautiful print and something unique! I have loved Jennifer’s art since I found her blog. I don’t yet own any, but I hope someday I will. And I might even win the giveaway. I would love the “Apple of Your eye” print! It’s a touch pick. If we were to win, I’d prolly ask the guys what they wanted in our home. And, the Believe with the lone tree. My favorite is Among Us because the truth of those words just overwhelms you,pierces your heart, and makes everything inside of you open up into eternity. I also like Such Things because that Scripture is so encouraging. I would choose the “Thank God For You” piece and have my son’e name “Hasting” inserted into it. He has made some poor life choices lately and is now suffering the consequences. Although God has been faithful, loving and merciful towards Hasting, and has forgiven him; Hasting has not forgiven himself. This piece would encourage him and remind him, that no matter what he does, I (his mom) thank God for him. May God bless you during this season of celebrating the gift of Jesus and all He has done for us. I also see one I will have to buy for my niece and her husband. They are expecting their first baby in the spring. “Picked” would be a perfect gift for them. I will share this giveaway on Facebook. I love Noel and My Prayers. Jennifer’s art is beautiful. What a wonderful giveaway! All of Jennifer’s artworks are special. I am really drawn to “Me and My house” – something we strive for. I love the layered look of some of her pieces. I would choose “True…Noble….Just……”for my office to remind myself & everyone that comes through what to “think on”….thanks for your art Jennifer…..keep creating! I love “This Child” and “Believes”. Both speak directly to me. I subscribe. I love your newsletters. They are always a blessing. The artwork is Wonderful! Thanks for sharing! Merry Christmas! I like the “This Child” print because I prayed to have a child, and he gave me two wonderful boys that I don’t know what I’d do without them. Thank you God for my kids, grandkids that are here now and those to come. Jennifer is one of my absolute FAVORITE artists. What a great giveaway! I love her work. I love how she loves Jesus. I love that she makes the world a more beautiful place. Thanks for hosting this fantastic giveaway. I am tweeting it right this second! These are absolutely incredible and direct us back to Him, the One who is the source for all our strength. I love all of them and it is terribly hard to pick, but the one that touches me at this time as we get ready for Christmas would be, “Thank God for You”. My dad was murdered 19 years ago when I was 17 years old. He left a wife and seven children ranging from ages 3 to 18, a small Baptist church he loved and pastored, and a town that knew him from his relentless desire to knock on doors and invite lost souls to meet a loving Savior. With Christmas upon us, we miss dad reading the Christmas story, always a kid on his knee, holding hands as a family around the dinner table for a prayer of thanks, his surprises under the Christmas tree, and his love for his family. I wish my babies could have met him and known how wonderful and fun he was. I am so thankful for the beautiful memories and security he left us. I thank my God every time I remember you, dad. Can’t wait for heaven where we will all be together again.